Co-presented with the Northrop’s jazz series, last night’s concert marked the Minnesota debut of Cuban percussionist Dafnis Prieto. Prieto’s music revels in the fertile middle ground between free jazz and the straight-ahead jazz rooted in 1950s hard bop. The songs that made up the more than 80-minute set, many of which were from his recent album Taking the Soul for a Walk, fluidly moved between composed and improvised. Surrounding Prieto were the other members of the sextet: Peter Apfelbaum (Tenor and Soprano Sax, Melodic, and Hand Percussion), Felipe Lamoglia (Alto and Soprano Sax), Ralph Alessi (trumpet), Manual Valera (piano), Charles Flores (bass), and, on one piece, dancer Judith Sanchez Ruiz. As good as these musicians were, Prieto was obviously the star. Watching him move effortless across the drum set brought about not only the “How is one person can making all those sounds?” cliché, but rather that the sounds and polyrhythms he’s coaxing from his set somehow all fit together into a composite groove that’s as exploratory as it is infectious. At times Prieto looked like he was barely holding his sticks as he lightly struck the rims and edges of his cymbals, producing a sound like a collection of skittering bugs. At other moments, including a bit of boom-bap during a duet with pianist Valera, he was as loud as the most aggressive amateur banging away at the “Integrity of the Insider” exhibit of Haegue Yang in the Walker’s Medtronic Gallery. 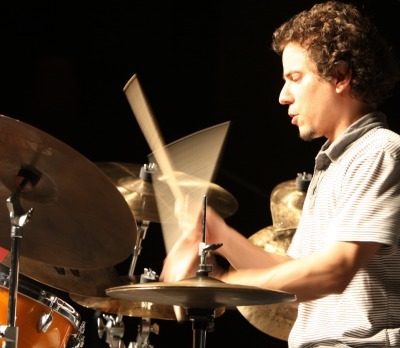 A favorite technique for Prieto was to turn the snare off, thus making it another tom, resulting in a palette of four closely-pitched drums that he played like melodically rolling waves. All that being said, the intimacy and tightness of the sextet made Prieto that much better. One of the best things about seeing good jazz live is to witness the subtle micro-interactions that make up a song, most of which are done on the spot. These are more than just smiles and nods, but rather the bounced back-and-forth of melodic and rhythmic fragments between soloists and members of the rhythmic section that show just how good a group is and how much they’re enjoying their work; this sextet had all of these characteristics in spades. Before the night’s final song, Prieto grabbed a pair of claves and, after doing a bit of cheeky self-advertisement for Taking the Soul for a Walk, proceeded to wow the crowd one more time with an incredible display of mouth percussion, double- and triple-tonguing his way through myriad sounds and patterns. In a return to the most elemental of musical relationships—the hand and the voice—Prieto produced unbelievable music with the simplest of means, making what he creates with a full drum set and locked-in sextet that much more astonishing.